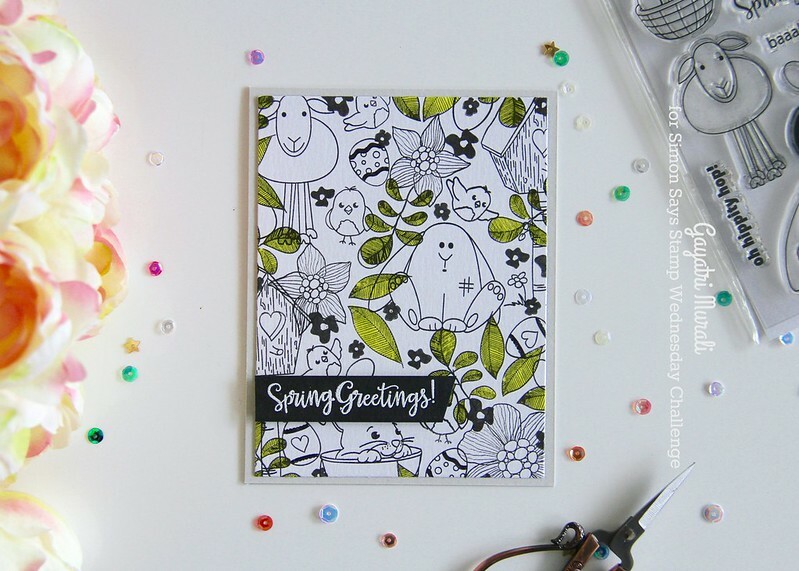 Thank you for joining us for the Fantastic Florals Challenge and we hope you will all join us again this week too. It’s time to get out your craft supplies and create whatever takes your fancy! 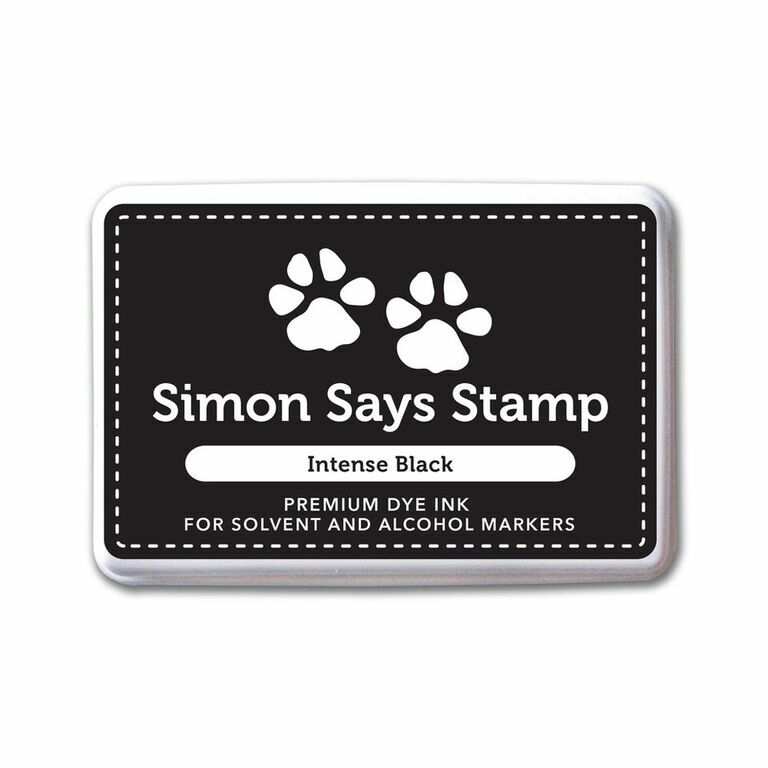 This week we are showcasing our very own Simon Says Stamp Exclusive Products this week. You don’t have to use them for the challenge but if you have them we would love to see them used. I decided to experiment design aspect with this challenge. 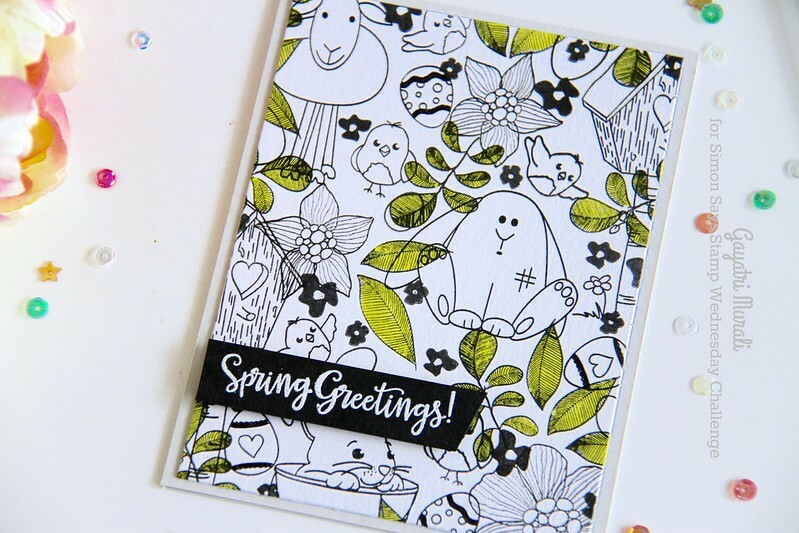 I wanted to make stationary style cards by stamping and creating my own patterns. 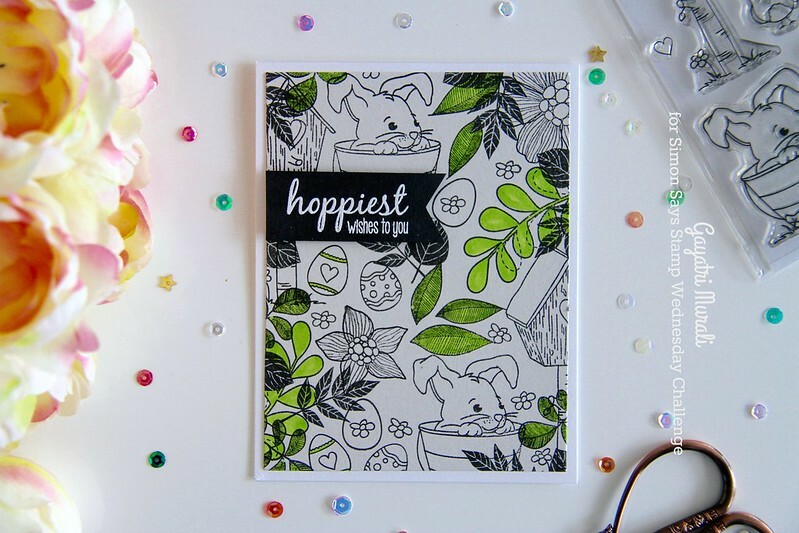 And the theme for the cards are Easter. Yes I made a set of two cards. 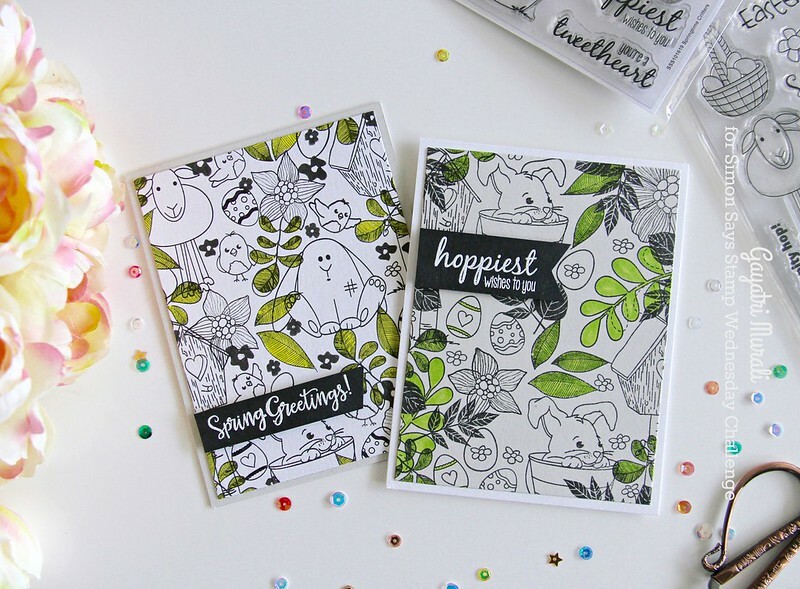 I used a few stamp sets from Simon Says Stamp on these cards. Considering the Easter theme, I wanted florals, easter images and some solid images. 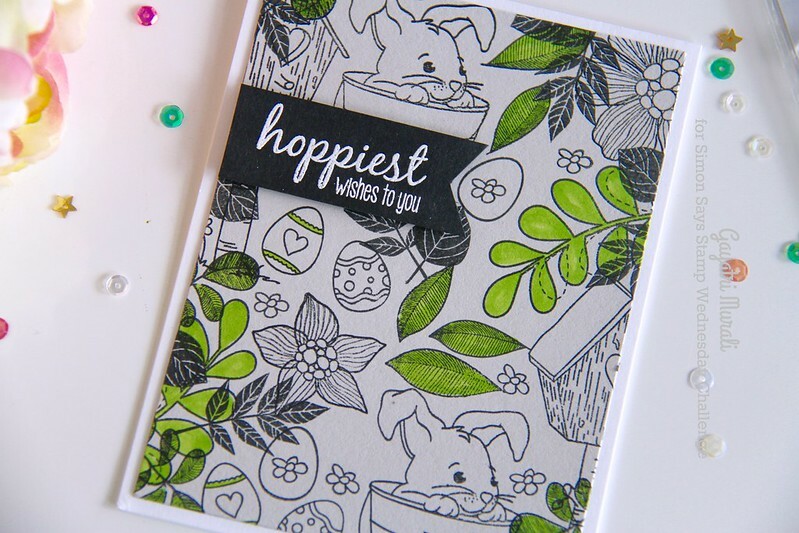 I picked Melody’s Easter, Springtime Critters, Winter Flowers, Nutty About You, Blooming Day and Summer Garden stamp sets. I used one white panel and one Fog card stock panel to stamp the images. Started with the largest image, I stamped clusters of images covering the entire panel leaving a few blank spaces. Most images are outline images but I also stamped some solid images. Most of the images are stamped overlapping each other. So there is no method to the madness. I kept stamping until I was happy with how the panels looked. I only coloured the leaves only using YG23 copic marker. Then I trimmed the panels using the second largest die from Hero Arts Infinity rectangle die set. I adhered the white panel on fog card base and fog panel on white card base using foam adhesive. 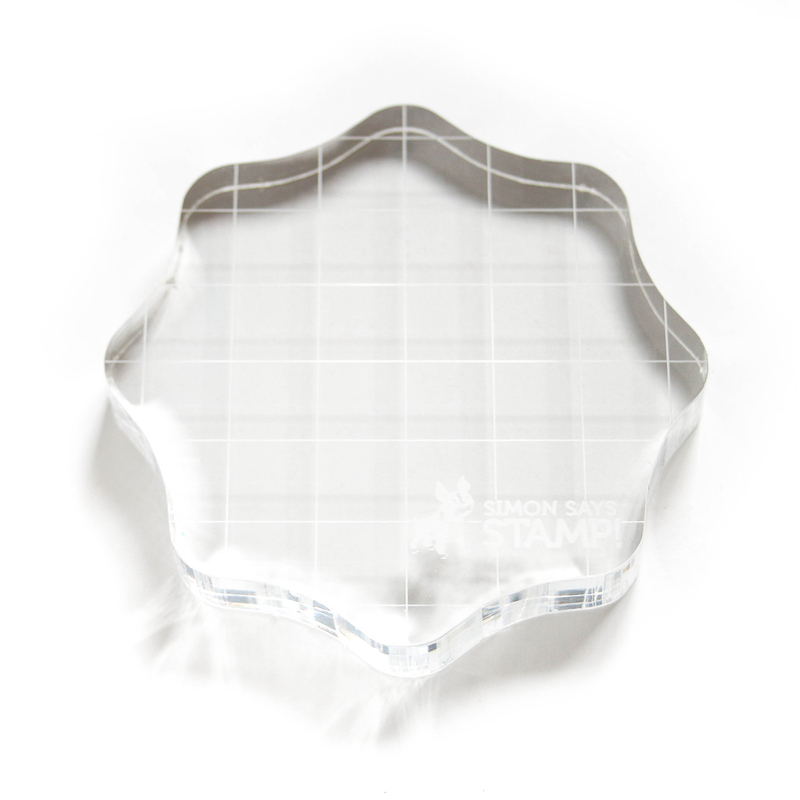 Sentiment is white heat embossed on a strip of black card stock and adhered as shown. No embellishments on the card as they are stationary styled card. Here are the photos of the cards and their closeups. All the supplies used to make the cards are listed below. What a fun idea, Gayatri! It could be adapted for so many occasions! Love this approach of selective coloring… it's gorgeous! I absolutely love this! Definitely going to try this!